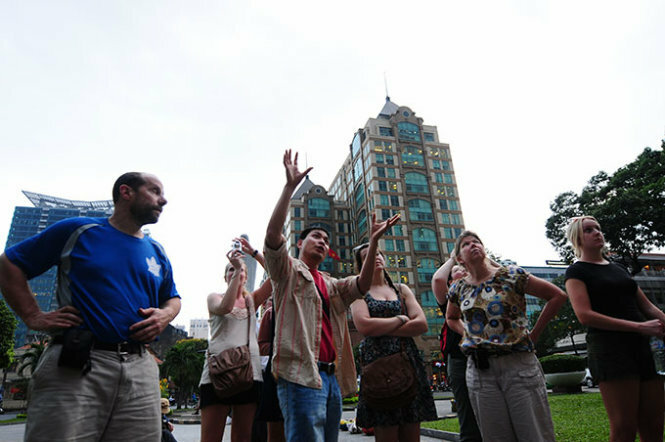 A tour guide gestures while introducing a place of interest in Ho Chi Minh City to foreign visitors in this file photo. Very few first-time foreign visitors to Vietnam choose to come back, according to a travel association, with multiple causes attributed to the low return rate. The Pacific Asia Travel Association (PATA) has said that of the 90 percent of foreign visitors to the Southeast Asian country who are first-timers, only six percent visit again. The Vietnamese tourist industry seems to focus mainly on ways to boost profit, leaving operational processes cumbersome, while at the same time, marketing campaigns remain limited. It is estimated that the annual marketing budget of Vietnamese tourism is around US$2 million. The primary focus remains on getting as many tourists as possible, without attending to the need to provide better services. According to a government resolution, Vietnam has extended its visa-waving initiative for citizens of the UK, France, Germany, Spain, and Italy until June 30, 2017. Since July 1, 2015, when it was initiated, the visa-free program has attracted more visitors from these countries, and it is expected that the program will continue to boost the local tourist industry. According to the Vietnam National Administration of Tourism, there were 4.7 million foreign visitors during the first six months of 2016. Notably, the percentage of tourists from the five countries granted visa wavers increased from 13.8 percent to 30.1 percent year on year. During the first six months of this year, the number of visitors from those five countries rose by 62,000 against the same period last year. In addition to granting visa waivers, the Vietnamese government is also implementing methods to streamline the immigration process for foreigners. According to many Vietnamese travel agencies, the 15-day visa-free duration for people coming from those five countries is quite short, luring only small groups of tourists to enjoy short vacations. Unfortunately, most visitors from Western Europe prefer tours lasting between three and four weeks. Streamlining immigration procedures for foreigners will make the Vietnamese tourist industry competitive on the world stage and especially amongst neighboring ASEAN countries. Free visas for the five Western countries is a great initiative, but it needs to be more carefully planned in order to better suit the situation and make Vietnamese tourism more competitive.